A 74-year-old woman had a lump in the right breast that had three years earlier been identified as benign. Her daughter later became concerned that the lump had enlarged. Mammography accompanied by computer- aided detection (VuCOMP M-Vu® CAD), automated breast density (VuCOMP M-Vu Breast Density), and ultrasound was performed. No prior exams were available for comparison, as earlier care was received in a foreign country. For three years the patient had repeatedly stated she would refuse biopsy. Initially, craniocaudal (CC) and mediolateral oblique (MLO) views were done on both sides, along with a right true lateral view. These showed a rounded mass in the right retroareolar region corresponding to the palpable site. VuCOMP CAD (Figure 1) of the RCC identified the large mass, along with multiple areas of clustered, punctate, and pleomorphic microcalcifications. Calcifications adjacent to the mass (Figure 2) showed a suspicious morphology, even though there were coarser, more- benign calcifications elsewhere. On the LCC, VuCOMP CAD marked calcifications with suspicious morphology in the outer breast (Figure 3). A magnified view of this area showed a small spiculated mass with significant architectural distortion (Figure 4). The mass contained the suspicious calcifications, some of which showed a linear configuration suggestive of ductal malignancy. Despite her initial reservations, the patient agreed to a biopsy after presentation of the mammography results. Pathology following ultrasound-guided core needle biopsy revealed grade 1 infiltrating ductal carcinoma in both breasts. The value of computer-aided detection in breast cancer screening remains a topic of debate1, 2. A survey of radiologists by Siegel and Mezrich3 found that 87% of radiologists believe they would provide the same level of care without the use of CAD. Additionally, 62% of respondents claimed that they rarely or never alter their assessment after reviewing CAD results. To ensure CAD efficacy, the FDA now requires that all new mammography CAD systems complete reader studies definitely demonstrating that radiologists perform better with CAD than without. (The VuCOMP CAD used for this case was approved under the new regulations.) These more strenuous regulations should lead to more effective mammography CAD systems. This case provides an interesting anecdote as to how CAD can be beneficial. Given the appearance of the mass and the history of prior benign biopsy, we might assume the lesion to be benign (i.e., a large fibroadenoma). Additionally, the size and brightness of the mass can easily distract from the more-subtle indications of malignancy: the pleomorphic calcifications and small spiculated mass. In situations such as this, CAD systems may draw attention to regions that could otherwise be overlooked. Large, bright lesions in mammograms can often distract from subtler foci of malignancy. CAD systems can help mitigate these circumstances, drawing attention to relatively inconspicuous but important findings. Birdwell RL. The preponderance of evidence supports computer-aided detection for screening mammography. Radiology. 2009;253(1):9–16. Philpotts LE. 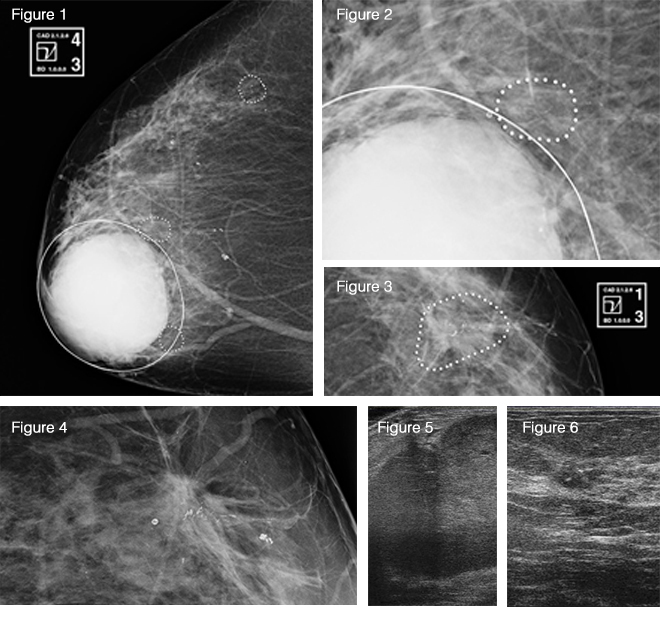 Can computer-aided detection be detrimental to mammographic interpretation? Radiology. 2009;253(1):17–22. Elliot Siegel and Jonathan Mezrich, RSNA, 2013. Mammography: Benefit of Computer-Aided Detection. Appl Radiol.